If you just bought a new truck or you’re in the market for one, you’re probably thinking about what accessories you’ll need to make it into the perfect vehicle. If you bought the truck for work or you know it’s going to get a lot of use hauling things around, you’ve probably started to look at bedliners. Bedliners are a great way to keep the bed of your truck looking great, but with so many different products on the market, it can be difficult to figure out what is the right choice. 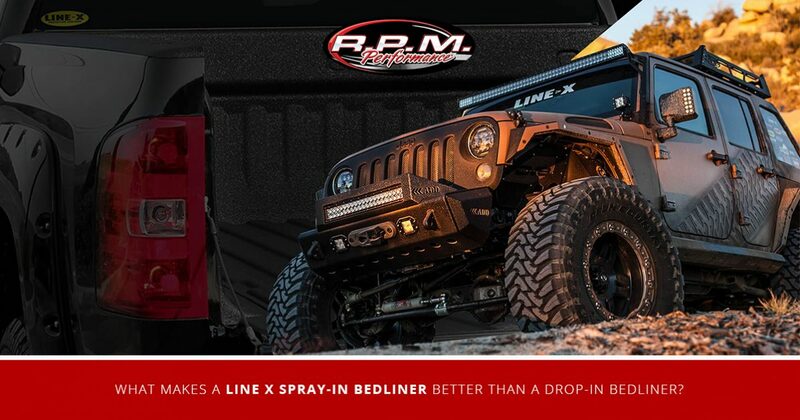 Do you pick up a drop-in bedliner because it is more affordable, or do you choose a high-quality spray-in bedliner from Line-X? In this blog, we will cover a few of the advantages of choosing a spray-in bedliner from Line-X over a drop-in liner. When you’re ready to have your new Line-X liner installed, give us a call at R.P.M. Performance in Burlington. We’re an authorized Line-X installer, and we have all of the other truck accessories you need to make your vehicle tougher and even better to look at. We’re also an experienced collision repair shop. If you need to get your truck back into great shape, we can help. One of the most common reasons that people get a bedliner is to protect the bed of their truck from damage. There are few things as frustrating as having your beautiful new truck marred by ugly scratches in the bed. While most people won’t even notice, you will. That can be hard to see every time you go to get into your truck. Instead of suffering through a scraped up bed, have R.P.M. Performance install a Line-X bedliner. Not only will this protect your bed from scratches, it is also very strong and will resist dents, dings, and damage that untreated beds can’t handle. If you use your truck for work or you spend a lot of time hauling stuff, preventing damage not only helps your truck look better, it will also last longer. While a drop-in bedliner can help stop some damage to your truck’s bed, because of the materials they’re made out of, they can’t withstand certain kinds of damage — specifically items being dropped. Drop-ins tend to shatter when something falls on them. In addition to the liner breaking, much of that energy is then transferred onto the bed of your truck. Drop-in liners can actually scrape up the bed of your truck if they aren’t installed correctly or if dirt, rocks, or debris get underneath them. So, really, what’s the point of getting one? Because a Line-X bedliner is sprayed directly onto the bed of your truck, there is zero chance that it doesn’t fit perfectly because it conforms directly to the exact shape of the bed, even if you already have a few dings or dents. Drop-in bedliners, on the other hand, only fit perfectly if they’re installed on an immaculate truck bed, and even then they aren’t guaranteed to never shift or move. Having an authorized Line-X dealer like R.P.M. Performance install your spray-in liner will make your truck look better than even the nicest drop-in liner. Drop-ins run the full spectrum in quality of fit and design. While you might find one that looks good, it will cost significantly more than a much cheaper one. Contact us at R.P.M Performance in Burlington today for a price quote on a spray-in Line-X bedliner or any other truck accessories you need to have the vehicle of your dreams!